The best known humanitarian roles of Switzerland relates to prisoners of war (PoWs). By the end of 1915, after a year and a half of war, there were already some 2.5 million prisoners held by the two warring sides. The main source of Swiss aid was through the Red Cross. This organisation, founded by the Swiss Henri Dunant in the 1860s, comprised an international committee based in Geneva (the International Committee of the Red Cross or ICRC) and separate but affiliated national Red Cross organisations in individual countries. National Red Cross organisations tended, amongst other tasks, to look after the well-being of PoWs of their own nationality, who were held in enemy camps. The ICRC did not have such affiliations, and played a more general role. Two of the ICRC important roles were co-ordinating information about individual prisoners, and monitoring conditions in PoW camps. 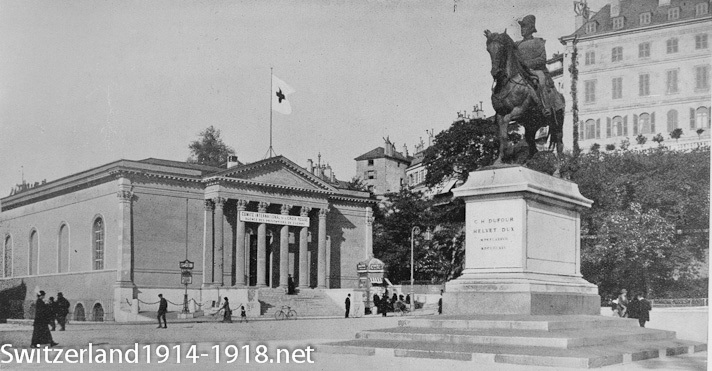 The ICRC was based in the Musée Rath in Geneva (shown at left). The task of trying to keep track of individual PoWs was immense. By September 1914, the ICRC was already receiving 3,000 letters per day, each enquiring about a person who was thought to be held prisoner. Each letter was replied to individually, and in the first year of war nearly 235,000 letters were sent out. The ICRC began recording information about individual prisoners of war and civilian internees on a card index, which by the end of the war the index covered some seven million names. The huge correspondence was handled by volunteers, as seen at left. About 120,000 people visited the ICRC in person to try to trace relatives. 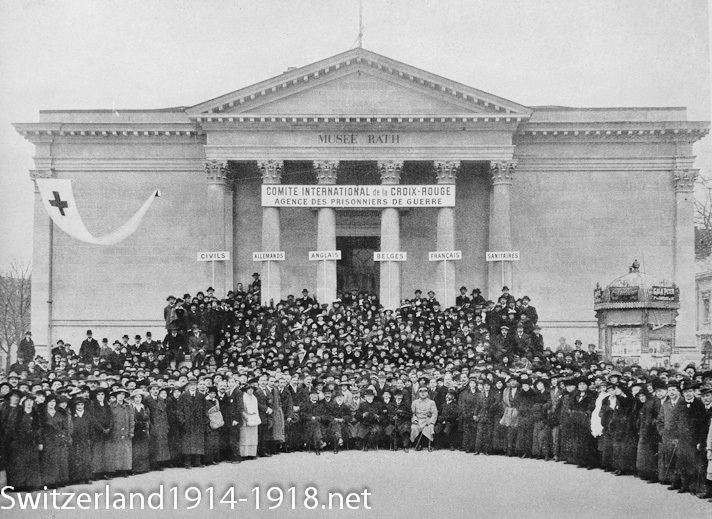 A group photograph showing volunteers who worked at the ICRC to provide help to prisoners of war and internees, seen infront of the Musée Rath. As well as the ICRC at Geneva, there were other organisations in Switzerland attempting to trace missing PoWs or civilians, as well as to send aid to PoWs. The Swiss Red Cross in Berne sent aid parcels to PoWs. Individuals or regimental organisations in the prisoner's own country could request that the Swiss Red Cross send aid to a particular PoW. Some of the most common items sent were bread, chocolate and Nestlé’s milk (condensed milk). The flour for the bread sent to PoWs was actually imported from France, which illustrates Switzerland’s dependence on imports! In late 1916, the Swiss Red Cross were sending out about 25,000 bread parcels each week. In April 1916, Lt William Reid RFC, a prisoner of war in Germany, wrote home to his parents “You ask about the bread from Switzerland. Well, it takes about two weeks to arrive, so it is rather stale by the time it gets here. It is also remarkably full of holes, but it’s quite eatable.” (courtesy of Royal Air Force Museum archives.) This kind of aid played a vital part in keeping prisoners of war alive, especially because there was so little food in Germany. Between mid-October 1914 and the end of June 1916, the ICRC’s agency for the care of PoWs had sent over 30,400,000 parcels. Letters, postcards and parcels were forwarded to PoWs by the Swiss post office: in March 1917 for example, over 420,000 letters and postcards, and 80,000 parcels. 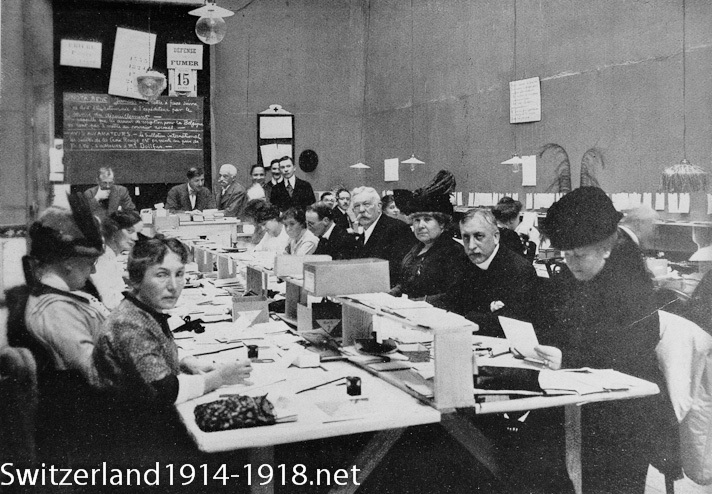 See the ICRC's new website to search their First World War period records. Click here to find out about the ICRC's role in inspecting prisoner of war camps.